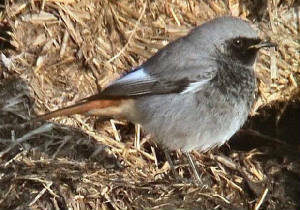 COMERAGH MOUNTAINS: 1 Black Redstart north of the Mahon Falls. 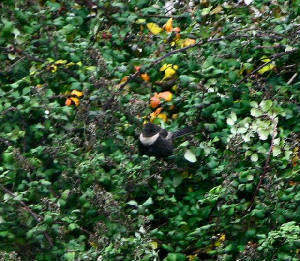 HELVICK HEAD: 1 Ring Ouzel. BROWNSTOWN HEAD: 1 Firecrest (possibly a different bird from yesterday), 1 Great Northern Diver (flew E), 1 Merlin, 2 Fieldfares, 4 Redwings, 1 Black Redstart, 4 Blackcaps, 6 Chiffchaffs, 5 Goldcrests, 12 Tree Sparrows. 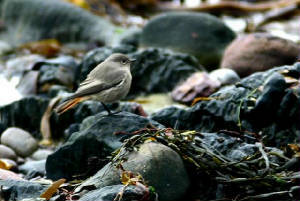 HELVICK HEAD: 1 Black Redstart, 2 Blackcaps. 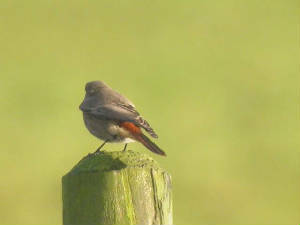 THE CUNNIGAR, DUNGARVAN: 1 Redstart, up to 10 Black Redstarts, 1 Wheatear, 1 Blackcap. 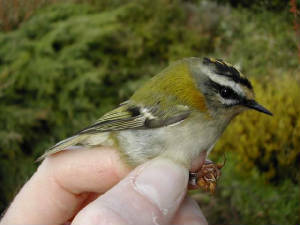 BROWNSTOWN HEAD: 1 Firecrest (trapped & ringed), 4 Black Redstarts (including an adult male), 1 Fieldfare, 2 Redwings, 4 Blackcaps, 2 Chiffchaffs, 13 Goldcrests. HELVICK HEAD: 1 Firecrest, 1 Swallow, 6+ Black Redstarts, 6+ Blackcaps, 5+ Chiffchaffs, 1 Willow Warbler, 1 1st-winter Little Gull, 1 Common Scoter. HELVICK HEAD: 1 Lesser Whitethroat, also 1 Redstart still present. THE CUNNIGAR, DUNGARVAN: 1 Shoveler, 1 Whimbrel, 2 Wheatears. BROWNSTOWN HEAD: 1 juv Corncrake, 2 Swallows, 565+ Skylarks, 4 Goldcrests, 7 Redpolls. DUNGARVAN: 2 Little Auks* off the Lookout/Tannery area. HELVICK HEAD: 2 Little Auks* flew past, also 1 Arctic Skua, 1 Sandwich Tern. BROWNSTOWN HEAD: 21 Snipe, 3 Goldcrests, 10 Redpolls. CLONEA STRAND: 2 Little Egrets, 3 Sandwich Terns. BROWNSTOWN HEAD: 1 Merlin, 1 Blackcap, 1 Chiffchaff, 7 Goldcrests. 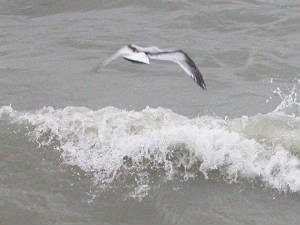 CLONEA STRAND: 1 Red-throated & 1 Great Northern Diver, 4 Sandwich Terns. BALLYNACOURTY POINT: 1 Merlin, 2 Swallows. 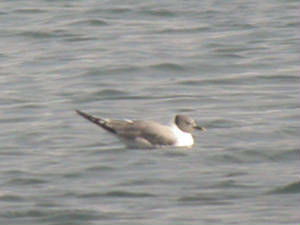 BRICKEY RIVER, DUNGARVAN: 1 Green Sandpiper, 13 Stock Doves, 1 Dipper. BROWNSTOWN HEAD: 5 White-fronted Geese flew E, 1 Redwing, 35+ Redpolls. BROWNSTOWN HEAD: 1 Merlin, 4 Swallows, 2 Chiffchaffs, 5 Goldcrests, 10 Redpolls. FIDDOWN, R. SUIR: 4 Little Egrets. WOODSTOWN STRAND: 3 Little Egrets. BROWNSTOWN HEAD: 1 Firecrest still present, 1 f/imm Hen Harrier, 260 Skylarks, 7 Swallows, 1 Wheatear, 2 Blackcaps, 1 Chiffchaff, 13 Goldcrests, 1 Tree Sparrow, 36 Redpolls. 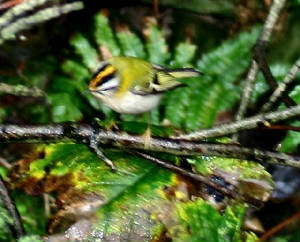 BROWNSTOWN HEAD: 1 Firecrest, 1 Merlin. 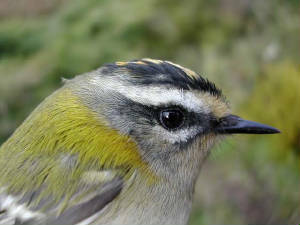 BROWNSTOWN HEAD: 1 Firecrest, 7 Goldcrests, 2 Chiffchaffs, 60+ Skylarks. 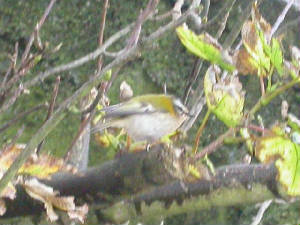 HELVICK HEAD: 1 Chiffchaff, 12 Goldcrests. BROWNSTOWN HEAD: 1 Wheatear, 3 Chiffchaffs, 19 Goldcrests, 24 Redpolls. TRAMORE BAY: 5 Red-throated Divers, 1 Common Scoter, 1 Sandwich Tern. ARDMORE HEAD: 1 Turtle Dove, 13 Goldcrests, 2 Siskins, 15 Redpolls. BROWNSTOWN HEAD: 1 Whinchat, 1 Blackcap, 1 Chiffchaff, 12 Goldcrests, 4 Redpolls. BROWNSTOWN HEAD: 2 Chiffchaffs, 6 Goldcrests, 1 Treecreeper (trapped & ringed - only the 2nd ever for the headland), 50+ Redpolls (47 ringed). TRAMORE BACKSTRAND: 22 Little Egrets, 153 Brent Geese, 6 Sandwich Terns. KNOCKADERRY RESERVOIR: 1 Little Egret. HELVICK HEAD: 1 Short-eared Owl flew E past the headland, 1 Wheatear. BROWNSTOWN HEAD: 1 Little Egret, 3 Merlins, 1 Redstart, 1 Wheatear, 2 Redwing, 6 Chiffchaffs, 10+ Goldcrests, 50+ Redpolls (42 trapped & ringed). BROWNSTOWN HEAD: 1 Garden Warbler, 1 Blackcap, 4 Chiffchaffs, 25 Goldcrests, 29 Swallows, 4 Redpolls. 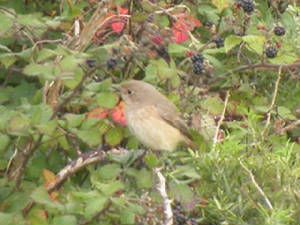 CLONEA: 1st-winter Red-backed Shrike*, 4 Whooper Swans, 1 Clouded Yellow butterfly. 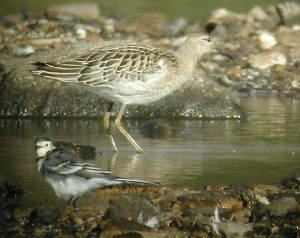 KNOCKADERRY RESERVOIR: Juv Pectoral Sandpiper & 1 juv Ruff still present. BROWNSTOWN HEAD: 1 Pied Flycatcher, 2 Chiffchaffs, 5 Goldcrests, 45 Swallows, 10 Siskins, 4 Redpolls, 30+ Chaffinches. 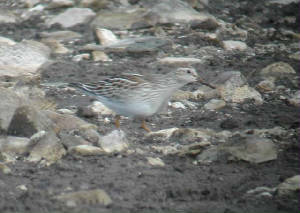 KNOCKADERRY RESERVOIR: Juv Pectoral Sandpiper, 2 juv Ruffs, 1 Common Sandpiper, 97 Teal, 2 White Wagtails. KILMEADEN POOLS: 4 Green Sandpipers. BROWNSTOWN HEAD: 173 Skylarks, 5 Goldcrests. HELVICK HEAD: 1 Snow Bunting. ARDMORE HEAD: 4 Chiffchaffs, 1 Willow Warbler, 13+ Goldcrests. HELVICK HEAD: 1 Great Skua, 1-2 Chiffchaffs, 10+ Goldcrests. 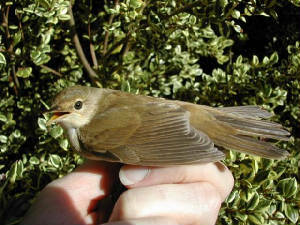 ARDMORE HEAD: Locustella warbler species (probably Grasshopper Warbler). HELVICK HEAD: 1+ Storm Petrel, 1 1st-yr Little Gull, 1 juv Black Tern; Great, Pomarine & Arctic Skuas. DUNGARVAN: 30 Little Egrets roosting nr Killongford. TRAMORE BOATING LAKE: 1 Little Egret, 260 Black-tailed Godwits. BROWNSTOWN HEAD: 1 Merlin; 5 Common Scoters flew E (1220-1250 hrs), 2 Common Porpoises. ARDMORE HEAD: 2 Willow Warblers, 1 Chiffchaff, 20+ Goldcrests. BROWNSTOWN HEAD: 1 Merlin, 1 Long-eared Owl, 1 Chiffchaff, 7 Goldcrests. KILMEADEN POOLS: 5 Green Sandpipers. KNOCKADERRY RESERVOIR: 1 Ruff, 42 Golden Plover. BROWNSTOWN HEAD: 1 Long-eared Owl, 1 Blackcap, 3 Chiffchaffs, 8 Goldcrests. 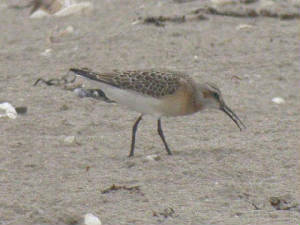 DUNGARVAN: 1 juv Curlew Sandpiper at the Cunnigar; 6 Little Egrets, 360 Redshank, 2 Common Sandpipers at Kilminnin. 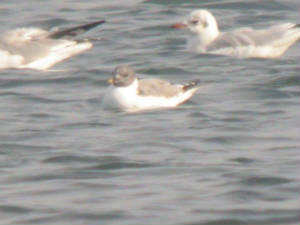 CLONEA STRAND: Adult Sabine's Gull still present, 220 Turnstones. 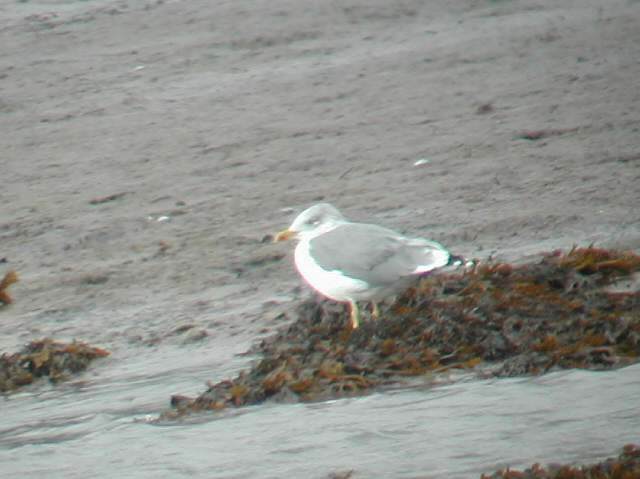 CLONEA STRAND: Adult Sabine's Gull close inshore, 1 Whimbrel. BALLYNACOURTY POINT: 1 Clouded Yellow butterfly. 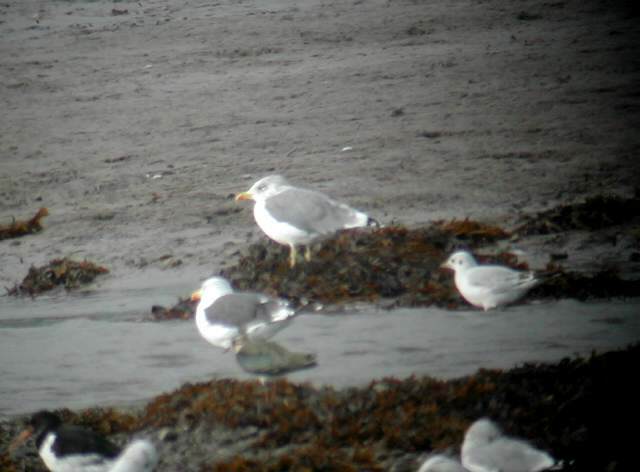 CLONEA STRAND: Adult Sabine's Gull (feeding with Black-headed Gulls close to shore), 1st-w Mediterranean Gull, juv Ruff, 1 Little Stint, 25 Sanderlings, 1 Whimbrel, 2 Arctic Skuas, 80 Sandwich, 12 Common Terns & 1 Arctic Tern, juv Black Tern. TRAMORE BACKSTRAND: 16 Little Egrets, 20 Brent Geese, 112 Mallard, 12 Greenshank, 55 Sandwich Terns. BROWNSTOWN HEAD: 1 Blackcap, 3 Chiffchaffs, 1 Spotted Flycatcher, 5 Goldcrests, 1 Redpoll. CLONEA STRAND/BALLYNACOURTY POINT: 1 Red-throated Diver, 1 Great Northern Diver, 11 Tufted Duck, 2 Arctic Skuas, 3 Wheatears. 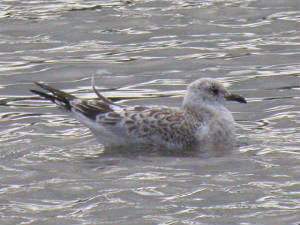 BALLYNEETY, DUNGARVAN: 1st-winter Mediterranean Gull. CLONEA STRAND: Juv Pomarine Skua, 7 Arctic Skuas, 1 Great Skua. TEMPLEMICHAEL, nr BALLYNATRAY (R. Blackwater): 1 Pied Flycatcher. HELVICK HEAD: 5-6 Arctic Skuas, 3 Great Skuas. 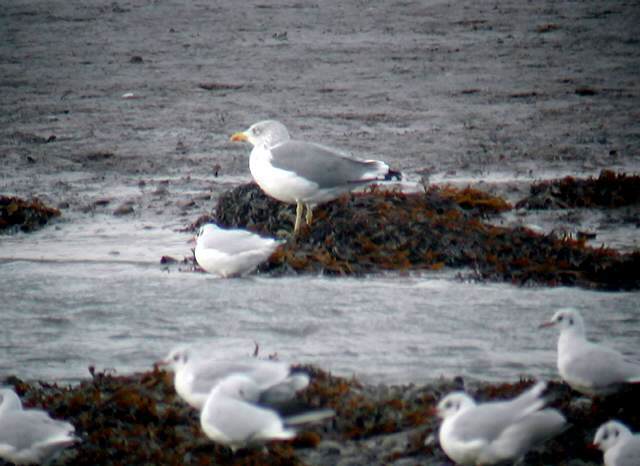 DUNGARVAN: Adult Yellow-legged Gull (at Ballyneety), 27 Little Egrets, 450 Bar-tailed Godwits, 1100+ Black-tailed Godwits, 435 Redshank, 51 Knot. CLONEA STRAND: Juv Ruff (unringed), juv Little Stint, 26 Sanderling, 2 Arctic Skuas, adult Roseate Tern, 6 Arctic Terns, 30 Common, 240 Sandwich Terns, 8 White Wagtails. CLOHERNAGH, TRAMORE BACKSTRAND: 16 Greenshank. CLONEA STRAND: 4 Arctic Skuas. 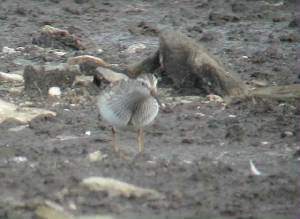 BARNAWEE/KILMINNIN, DUNGARVAN: Juv Ruff (with metal ring on left leg), 1 Whimbrel, 3 Common Sandpipers. HELVICK HEAD: 1 Sooty Shearwater, c.12 Arctic Skuas, 2 Roseate Terns. BROWNSTOWN HEAD: Single Whinchat, Spotted Flycatcher, Wheatear, Chiffchaff, 2 Goldcrests, 19 Choughs; at sea, 4 Sooty Shearwaters & 156 Manx Shearwaters flew W, also 1 Common Porpoise (seawatch 1400-1500 hrs). 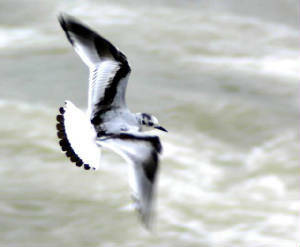 CLONEA STRAND: Adult Roseate Tern. HELVICK HEAD: 1 juv Sabine's Gull, 2 Sooty Shearwaters & 40 Manx Shearwaters flew W, also 5 Arctic Skuas (1 W), 1 Great Skua & 3 Common Porpoises (seawatch 1745-1900 hrs). HELVICK HEAD: 3 Arctic Skuas. DUNGARVAN: 1150 Black-tailed Godwits (mainly at Ballyneety), 16 Knot. HELVICK HEAD: 1 Sooty Shearwater & 76 Manx Shearwaters flew W, also 12 Arctic Skuas (8 W), 3 Arctic Terns, 24 Common & 100+ Sandwich Terns (seawatch 1940-2040 hrs). HELVICK HEAD: 3 Leach's Petrels, c.80 Storm Petrels, 1 juv Sabine's Gull, 1 Sooty Shearwater, & 15 Arctic Skuas (1.5 hr seawatch, evening). BALLYMACART: Probable juvenile Honey Buzzard*. BROWNSTOWN HEAD: 1 juv Reed Warbler trapped & ringed, also 2 Whinchats, 8 Wheatears, 1 Blackcap, 5 Chiffchaffs, 1 Willow Warbler, 8 Goldcrests, & 2 Clouded Yellow butterflies. LISSELAN, TRAMORE BACKSTRAND: 31 early Brent Geese (14 adults + 17 juveniles), 27 Little Egrets, 270 Redshank, 2 White Wagtails. KILMEADEN POOLS: Female/immature Hen Harrier, 20+ Sand Martins, & a late Swift. BALLYSHUNNOCK RESERVOIR: 40 Teal, 1 Dunlin. DUNGARVAN: 16 Little Egrets roosting between the Cunnigar and Killongford. BROWNSTOWN HEAD: 14 Sooty Shearwaters, 300 Manx Shearwaters, 3 Great Skuas, 1 Arctic Skua & 1 Puffin flew W in 2 hrs (1000-1200). KILMINNIN/BARNAWEE, DUNGARVAN: 9 Little Egrets, 475 Black-tailed Godwits, 425 Redshank, 24 Greenshank, 2 Common Sandpipers. CLONEA STRAND: 5+ White Wagtails. HELVICK HEAD: 1 Balearic Shearwater, 3 Sooty Shearwaters, 128 Manx Shearwaters, 3 Storm Petrels, 2 Great Skuas & 1 Puffin flew W in 1.5 hrs (1720-1850). BROWNSTOWN HEAD: 1 Balearic Shearwater, 3 Sooty Shearwaters, 240 Manx Shearwaters, 3 Common Scoters, 1 Arctic Skua & 7 Roseate Terns flew W in 2 hrs (0910-1110); on land, 7 Wheatears, 4 Chiffchaffs, 2 Goldcrests & 18 Choughs. TRAMORE BACKSTRAND: 20 Little Egrets. 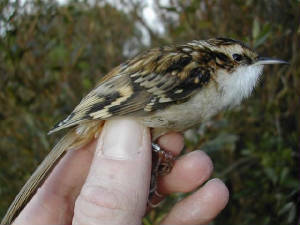 BELLE LAKE: 3 juv Reed Warblers trapped & ringed. BROWNSTOWN HEAD: Single Pied Flycatcher, Spotted Flycatcher, Sedge Warbler & Whitethroat, 2 Chiffchaffs, 3 Willow Warblers, 3 Goldcrests, 1 Redpoll. 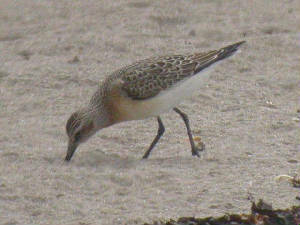 THE CUNNIGAR, DUNGARVAN: 2 juv Curlew Sandpipers. CLONEA STRAND: 16 White Wagtails. BALLYNEETY, DUNGARVAN: 590 Black-tailed Godwits, 23 Knot, 1 Common Sandpiper. BROWNSTOWN HEAD: 1 Migrant Hawker dragonfly.